"Light the Candles Wherever You Can, You Who Have Them"
In the same way that lies have gone out from people's hearts, penetrating throughout the world and destroying it, so should-and so will-the truth begin its healing service within our hearts. Light the candles wherever you can, you who have them." As much as I see the internet as part of the artificial, inauthentic life modern man has created, it IS, nevertheless, a light. We each must find the light God has given us to save souls at this very late hour. 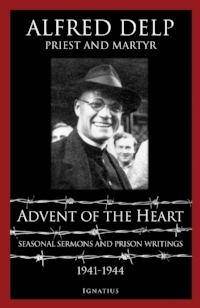 Excerpts from "Homily for the Fourth Sunday of Advent, Preached in Munich, December 21, 1941:"
...he is master of the situation and of all things, because of being truly in contact with the center of reality..."
This union with God is not merely our goal or end, it is to be experienced right now in the present moment. The door we must pass through is the door of contrition in the sacrament of Penance, which leads us to Holy Communion, where we become one in mind and heart with Christ. May we, this Christmas, receive Him with a deeper spirit of yielding than ever before, becoming "so totally other," that we will shine with His light for all to see!